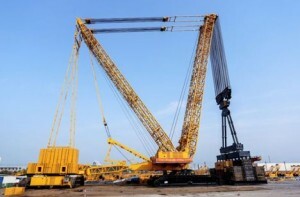 Chinese crane manufacturer XCMG says that it has successfully lifted a 4,500 tonne test load with its 88,000 tonne/metre XGC88000 crawler crane. The crane, which can also be configured as a 2,000 tonne class crane is similar in concept to the Terex CC8800 Twin and has previously lifted 2,500 tonnes with a 96 metre main boom. The company now claims to have set a new world record with the 4,500 tonne load lifted on a 60 metre main boom at which the load moment was 79,800 tonne/metres making the radius roughly 17.5 metres. The construction wing of Sinopec which worked with XCMG to develop the crane and has ordered the first unit to work on new petrochemical construction activities.